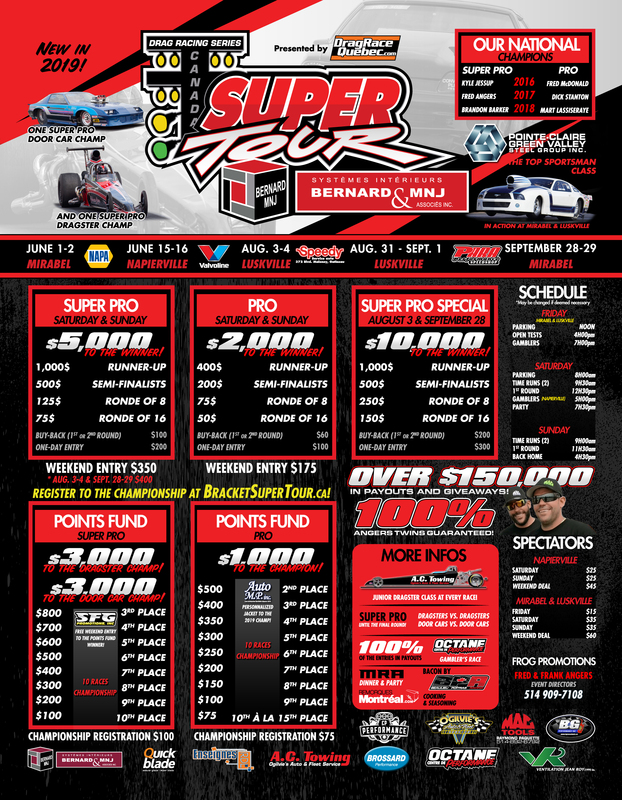 The Bracket Super Tour presented by Bernard MNJ & Associates Interior Systems unvailed this morning its 2019 official flyer for his fourth season of activities. The same popular formula is back with the addition of some new features for the racers and spectators. The Bracket Super Tour offer more than $150,000 in payouts and giveaways over five racing weekends. The best ratio of entry fees and payouts in Canada, the biggest points fund and the best racer experience. In 2019, two Super Pro champions will be crowned, a Dragster Champion and a Door Car Champion. Each champions will receive a $3,000 payout and the racer with the most points will also receive a free weekend entry at one of SFG Promotion’s race next year. This year, the Top Sportsman category presented by Pointe-Claire Steel Distribution will be competing at both Mirabel events and the Napierville event. Details for this new category will be announced soon. The season will be launched on June 1st and 2nd at ICAR Mirabel with the event presented by NAPA Auto Parts. The activities will continue on June 15 and 16 at Napierville with the Valvoline weekend. Racers will then travel to the Outaouais region at Luskville Dragway for the 34th annual of the prestigious Bracket Bonanza on August 3rd and 4th and after that on August 31st and September 1st at the Speedy Auto Gatineau event. 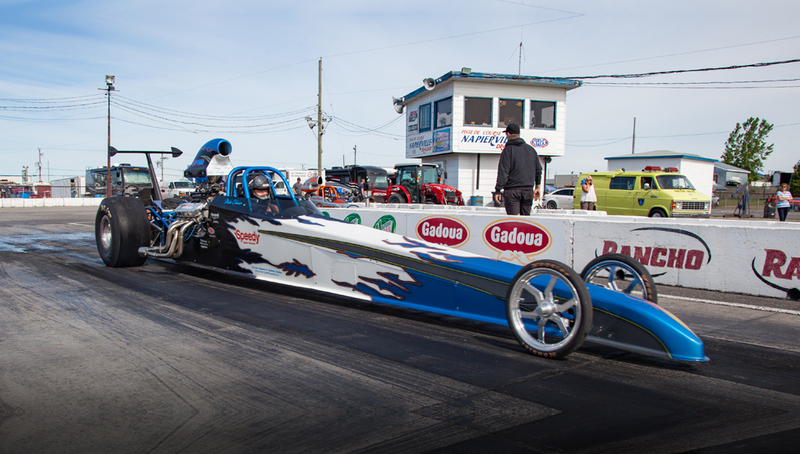 The drag racing season will end with the traditional PARA Performance Bracket Finals at ICAR Mirabel on September 28th and 29th. This season, all 10 events will count for the Pro and Super Pro points fund. Championship registration is $100 for Super Pros and $75 for Pros. The winners payouts in Super Pro on August 3 and September 28 are raised to $ 10,000. Weekend Entry will be $400 for these weekends. As in past years, the Ogilvie Auto Service Junior Dragster class competes at all events. Dragsters and door cars are separated until the final round. The Metaux Angers dinner and party is free for all members and includes the famous grill bacon offered by Beaulieu-Poitras Racing and cooked to perfection by our chef André from Remorques Montreal Trailers. The Octane Performance Gambler’s Race is back as well at each event. Several giveaways will be awarded to members during the events. B&G Performance will offer a $50 gift certificate to all winners in both classes. The Best Appearing Car of each event will receive a NAPA BodyPro car care kit and the racer who will take out the previous race winner will receive an Octane Performance t-shirt and cap. Other giveaways will be added during the season. Racers who register as a member before the end of April will receive a Super Tour cap during the first event of the season and will be eligible for the draw of a MAC Tools toolbox that will be drawn on Saturday May 4th, 2019 at the Auto Sport Show in Quebec City. Registration is easy to complete by visiting www.BracketSuperTour.ca to sign in as a new member. The Bracket Super Tour Team would like to thanks its many sponsors: Hugo Bernard from Bernard MNJ and associates, Martin Samson from NAPA Auto Parts Canada, André Michaud from Valvoline Canada, Speedy Auto Gatineau’s Mike Chénier, Frank Paradis at Para Performance, Francis Deaudelin at Quick Blade Wipers, Paul Plamondon from Enseignes RDL Signs, Mike and Vicki Ogilvie at Ogilvie Auto & Fleet Service and AC Towing, Claude Robitaille at Brossard Performance, Carl Provencal from Atelier CP Performance Workshop, Raymond Paquette MAC Tools Agent, Jean-Pierre Gobeille from B & G Performance Sunoco, Jean Roy Ventilation, Pointe-Claire Steel, Autos MP Laval, André Ballabey from Remorques Montreal Trailers, Jay Beaulieu from DragRaceQuebec.com and Octane Performance Rivière-du-Loup, Kevin Poitras from Beaulieu Poitras Racing, Arnie Malcolm at Luskville Dragway, the Brunet family at Napierville, the staff at ICAR Mirabel and the Angers twins of MRA Métaux Angers. The entire Bracket Super Tour team invites you to come and chat about the next drag racing season at the Auto Sport Show in Quebec City from May 3rd to the 5th. The Bracket Super Tour will be well represented with a three-car boot. Come get your poster and sign in to become a member!